Enjoy meals on your lanai, which is surrounded by tropical palms and foliage and enjoys fresh Island breezes from the Pacific! Maui Banyan T101a is fully renovated and feels very spacious the moment you walk in the door. It is a studio bedroom with 1 full bathroom, a small refrigerator, microwave. It is on the ground floor, and the patio is slightly above ground. It has a waist high glass balcony wall/railing, so perfect for enclosing toddlers, while not feeling cramped. The balcony faces East over the upper pool area and receives lovely sunlight. There is also new tile and soft wood flooring throughout this beautifully updated unit. The room has two twins that can be pulled together to make a King size bed. Need more room?? This condominium can be rented as a two bedroom, one bedroom (the unit you're looking at) or a hotel unit. The unit was renovated in 2005 and has newer furniture. T-101 is located on the main floor near the building entrance and across from the second pool. BBQ’s are available for use near the pool area. VERY IMPORTANT NOTE! This unit is strictly NON-SMOKING, and we appreciate your cooperation in this. Also, according to Hawaii law, the lanai and common areas are also non-smoking, so please refrain from lighting up anywhere, inside or out. Mahalo! ​Maui Banyan is named after the stately banyan tree, one of the most beautiful trees of Hawaii, distinguished by the large, impressive canopy it creates. Maui Banyan is home to several of these majestic trees. ​Located in South Kihei, directly across from Kamaole Beach II, the Maui Banyan Resort is the perfect place to call home. Guest enjoy the convenience of two swimming pools, hot tubs, tennis courts, gas BBQ areas and many other amenities. 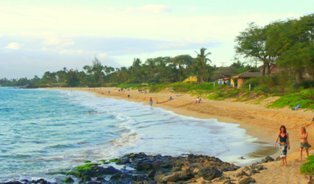 Just minutes away, you'll find two other beautiful beaches, Kamaole 1 and Kamaole 3, in addition to many shops, restaurants, activities stands and shave ice spots! We're also just minutes (in a car) away from many first-class dining experiences, like Sarentos' on the Beach and Nick's Fish House! Kamaole Beach Park - Across the street!